This site was developed to compile free information found on the web to help you train and maintain your barrel horse. Creator Michelle Davey will also add her personal tips and learning along the way in posts as well. We are always open to contributions from our readers and followers. This is a site where we can learn from each other to become better horse people and better barrel racers. Ideas, suggestions and tip submissions are welcome! ( not just barrels but aslo pleaser ridding at home so you don’t take it the wrong way) he was good until one jackpot he would’nt go into the arena and proforme he would just stand there and no move a mussel. I tried him at home and he runs awesome so I just gave him a few months off the barrels and just did normal ridding on him i took him to a jackpot about a month ago and he did the same thing but i finally got him to run we were in the bottom 2D the next jack pot i took him to he did better but is there any thing i can do with him ?? am i doing somthing wrong?? 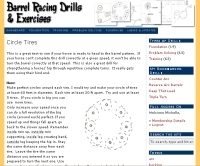 Have a look at Sherry Cervi’s drill I posted recently. She stops her horse on the way to first to get him listening to her. You might also try slowing it down a bit for a few competition runs to get your confidence back at that first barrel and have your horse listening to you not just doing what he thinks he should be. hello i have a barrel horse who runs the pattern not bad but she always cuts the first barrel win but at my place she don’t any tips i can do with her she dose give me all her speed but just not her head on the first barrel! i put a diffrent bit on her and a tie down she needs one because she gets grumpy when you don’t let her go can you help? What do you think is a good age to start a horse on barrels? Hey, I have been looking for a new horse for awhile. The man who helped me get started has offered to trade his registered mare with my older Appaloosa. The mare stops really hard on her front when going around the barrel. She also refuses to go into the arena but is not a seasoned barrel horse. I’m concerned that it may be a health issue. If it is not a medical issue, can these problems be fixed? Her perks over my App are that she is faster, younger, and registered. I just want to make the right dicesion of whether she is a good investment or not. Will you enjoy the horse even with her bad habits? I’d go with the one you are going to have the most fun on. I am finishing a barrel prospect and I can not get him to switch his lead consistently from the first barrel to the second barrel. He was a cutting horse so is very broke and has a good handle. We do a lot of loping exercises but it isn’t working! What can I do to get him to switch leads after the first barrel? There is a drill in my book I’m going to be releasing soon. What I do is circle first then start to turn it again and do a circle in the opposite direction at the top of first (figure 8). This figure 8 exaggerates the turn, then we do a simple lead change to change direction. This really seems to help their understanding. After you’ve repeated this a few times over finish just a hair, then push to second – he will likely swap leads! I have two main concerns about my barrel racing experiences. One; MY LACK OF CONFIDENCE! is there any techniques to help ease my mind and boost my confidence? Two; my 2nd barrel. My horse has a big problem not finishing the turn and making a rainbow from 2nd to 3rd. Maybe its something I’m doing? Any ideas for exercises? please help! Read mental training books to help with your mind set for barrel racing. I really got a lot out of the book “Mind Gym” Regarding your arc to second – sometimes this can happen if you aren’t giving enough room on the way into your turn. It can happen if a horse is sore in the hocks. It can happen if you are pulling on his face too much in the turn. It can happen if you are rushing your turn and looking up too soon. My favorite drill to help with this is to double the barrel, even triple it in practice to take the anticipation of running off out of the horse. Hi! I am currently training a big palomino horse to run barrels. He is super hot.. he’s not a total knot-head but he has a ton of go and is really flexible. He’s eager to please though and I consider myself an experienced rider so I feel as though he would work out for me.. The one problem I have with him is getting him to run straight. He is always side passing.. He’s a total sweetheart on the ground, not spooky at all or anything. How can I work on getting him to come out of a turn and run in a straight line??? Thank you for your feedback Haley! I would work on your straight lines away from the barrels. Look to a point in the arena and ride to it. Really focus on your riding and communicating clearly that you want a straight line (through your balanced seat and hands). I would then work on squares where you will combine a corner and straight lines. Once he can do a nice square, I bet you’ll see an improvement on the pattern. I have a barrel horse that I’ve been training almost a year now. I’ve only had her on barrels for about six months. She’s done awesome considering she’s only been to about 5 shows, she’s running 21’s. She drops seconds every show. But something about the first barrel in the arena she turns it really wide! At home she doesn’t do that, she turns them perfectly without any problem. Well at the last show which was last weekend, she still continued to turn the first barrel wide but the other ones are perfect. My friend who is a trainer also rode her that night and when she went wide, she made her straighten up and go around the barrel about 2 or 3 times in the arena. Well when it was time for me to ride again, she went ok so the first barrel but not as good at the others but ended up spending around twice and caused us a no time. I was pretty angry but I just want to know if there’s anything I can do?? I go to the right barrel first and then make the two left turns great. But like I said, she doesn’t do it at home, just at shows! Help pleasee! At shows there is going to be a lot more to be distracted with. I would really make sure you have a hold of her and you are looking where you want to go and and clear and confident with your body language and direction. She can only be as confident as you are. It might take going slower to first for a while to really make sure she is looking for that barrel and sees it coming. I have a 7 year old palomino that has been stubborn his whole life, but he has come a long way. I have recently tried to start barrel racing with him, and I know he can do it. He has a perfect body for barrel racing and he can corner well. But when I get to the second barrel he doesn’t complete the turn, he runs off in the opposite direction than the third barrel.He pulls his head up and wont listen. I think it is because he is trying to run to the gate, he may be barn sower, but he has never been barn sower before. How do I correct this problem? He also doesnt turn very tight in the first barrel, he runs a wide circle. When I get through the first and second barrel (even if there are some issues) he always does the third barrel perfectly. I would take him to a vet for a full physical before you work him further. Don’t be too hard on yourself, I think he is trying to tell you something is bothering him. Get that fixed up and start slow and build back up so he gets his confidence back.